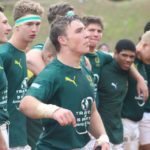 Glenwood scored nine tries to thrash Durban High School 55-12 at Glenwood on Saturday. DYLAN JACK reports. Watch the 1st XV match between DHS and Maritzburg College at 14:10 on Saturday.